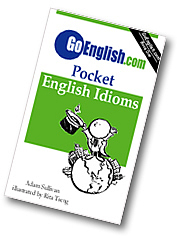 Today's Idiom = "In(s) And Out(s)"
In and out is the way you know something when you know it very well. Example: "I've been in this business for 30 years. I know it in and out." Example: "I know this city in and out." When you add the s and say the ins and outs, you are talking about the special ways that you know to do something, when you know it very well. Example: "I hope you can help me. I want to learn the ins and outs." Grammar point: In and out acts like an adverb ("I know this in and out"). The ins and outs acts like a noun ("Teach me the ins and outs"). Example: "My friend Jeff has worked in publishing for 15 years. He knows all the ins and outs."